Wow!!!!!!!!! so cool!!! !...Thanks for all the great comments/votes this was one tough challenge.....COOl!!! Went down to the high school late at night, only one light on. Processing; desat, levels, darken neutral color, cropped, usm, save as web. Great shot, congrats on your first ribbon! Well done Joe! Now we want another couple of ribbons for our team during WPL3. B&W works great for your picture. Congrats on your first ribbon! This is such a deserving ribbon! Congratulations on your firt one! This is totally awesome! Well done Ace... congratulations on a great image! Congrats on your first ribbon and second-highest score! WTG Joe! Congratulations on your first ribbon! Sweet!! Congrats on the red ribbon!!! Congrats on the ribbon, Ace! Greta tones and shadows. One of my favorites of the theme. Nice idea and exection, wonderful lighting. I'd prefer a slightly tighter crop. I like it. I like the conversionation - dramatic. The shadows show the lateness of the day which adds to the sense of "after the game." The compostion of the bat, ball and glove is nice. Nice story being told here. Your image is strong and well composed. I really like this. The B&W works well, gives it more feeling of lonliness and emptiness. Very evocative of loss, of failure. I like. Great use of light. 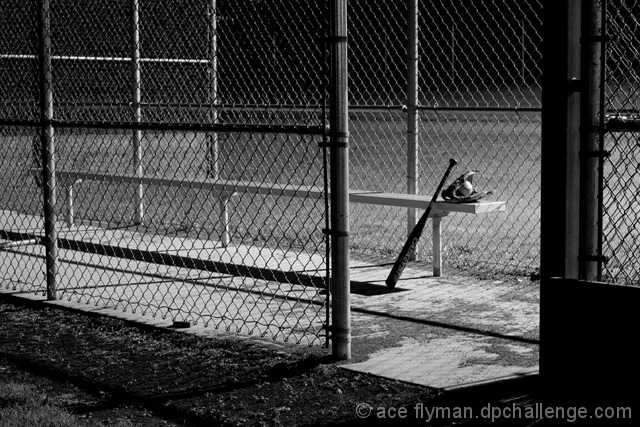 I like this, It captures the lonliness of the empty ball field. The leftover equipment makes you feel it's AFTER the game as the challenge stated, (even though I realize it could be staged)rather than just giving you the feel of an empty park any time. Overall, I'm not really bowled over by this, although due to the tough challenge, I'm trying to overlook that. The high contrast really makes this image pop and gives a nice first impression. After that, though, my eye has a hard time figuring out what to look at since the whole image is essentially diagonal lines. For this challenge, quite nice, but it leaves me feeling a bit flat. overall score: comp-2, MC-2, PP-2, impression-2, wow-0 = 8. Proudly hosted by Sargasso Networks. Current Server Time: 04/24/2019 07:49:09 AM EDT.